I can’t remember when or where I first heard about pretzel chicken. It was a long time ago. I remember putting it on my mental to make list, and over the past few years, it kept getting pushed further down. Not for any particular reason, I knew I would love the dish, but because we never seem to have pretzels and chicken in the house at the same time. To make this dish last night, I had to pry the pretzel bag away from my son and husband. There’s no other salty snack they seem to like better than crispy pretzels, except maybe for big soft pretzels. To make the chicken, I ground up pretzels in the food processor, and then used them as breading. I fried the chicken to make them extra crispy, and then served them with a honey Dijon mustard sauce. I added a simple spring mix salad and dinner was done. Combine mustard and honey for sauce. Mix well and set aside. 2. Preheat oil to 350 degrees. Combine eggs with spices in a large bowl. Mix well and add chicken. 3. Add pretzel crumbs to a large bowl. When oil is hot, bread chicken and fry in oil until deep golden brown. Chicken should be firm and have an internal temperature of 165 degrees. Place on paper towels or cooling rack after removing from oil. I love it when you say easy, because It’s true. I’ve made a few of your “easies” and I’m always happy with out quick and tasty it turns out. I love any alternative to straight-up breadcrumbs, and can’t imagine why I’ve never thought of pretzels, before! And with that honey-dijon sauce? Perfect! I love the pretzel crust! Have you ever tried a potato chip crust? I’ll try soon, thanks for the idea! This looks amazing. Super family-friendly too! ohhhh what a kid-friendly recipe!! looks amazing. I never thought to use pretzels before – I’ve used potato chips though…What a great idea! What a great idea! Never thought of using pretzels, but I think they would be fantastic. Trying this the next time the grandkids are over. wow, that pretzel breading looks awesome! I want to try making the honey mustard sauce using my beer mustard. I came across your recipe on BlogHer. It immediately made my mouth water as I love fried chicken and love pretzels! I’ll have to give that one a try for sure! I absolutely love the idea of a pretzel crunch on chicken. It looks so good I think I’ll have to give it a try. Pretzels with chicken? This I gotta try on the weekend. Cooking this with my boyfriend right now! So excited to try it. The writer doesn’t mean cooked scrambled eggs, though it does read that way. Just use two eggs, whisked, but not cooked. Flawed writing + someone that doesn’t know how to interpret a recipe = scrambled eggs with raw chicken in them. Fun salmonella times for all! WELL! how did it taste?! I am dying to try it but don’t want to ruin it by it tasting just like pretzels! I know my kids like pretzels but if it’s on their chicken…they will have a fit! LOL Like Pretzel Salad…I never once tasted the pretzels in it at all! Is it the same this way? Can this be baked? Or does it have to be fried? I haven’t tried baking it, but I’m sure you can. You would probably have to spray the breaded chicken with a non-stick spray first though. I just made this pretzel chicken tonight and it was delicious! Very crispy and flavorful on the outside and moist chicken on the inside. 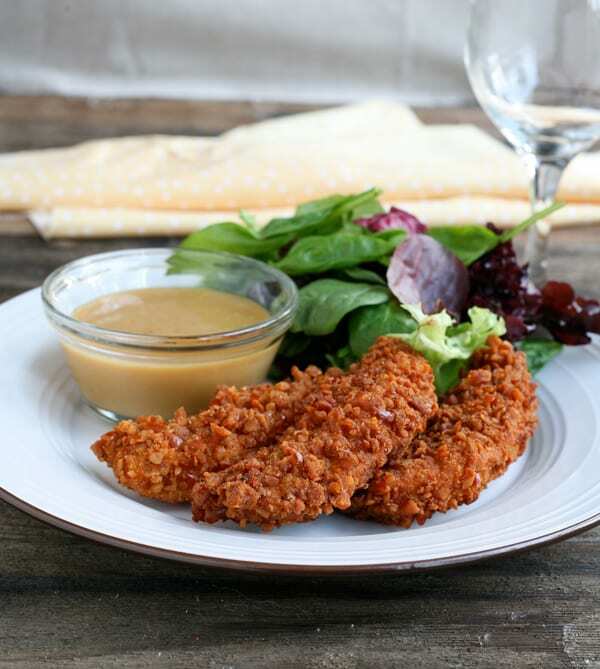 I served it with your easy honey mustard sauce and my kids and I gobbled it up! The pretzel coating is addicting. Will make again.